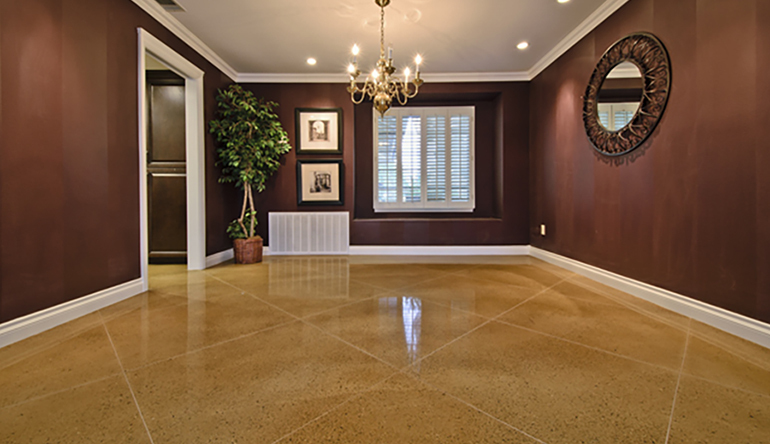 ACI Flooring - Concrete Polishing Chino Hills California | ACI Flooring Inc.
Polished concrete has become very popular in the last five years, especially in the city of Chino Hills. The assumption is that concrete needs to be covered with tile, laminate or coating. No one considers the concrete substrate itself as a finished floor. Polishing of terrazzo, natural stone, granite and marble is a great alternative. During this process the concrete is treated with a water based densifier to penetrate under the pores of the concrete to react and crystallize within and densify the concrete surface. Starting with a low grit diamond and progressively working up with high grit diamonds. Diamond cup wheels are used to polish the perimeters and around tight areas and columns. Concrete is not considered polished until at least a 400 grit, with at least 5 step minimum. Mostly it’s finished no higher than 800 grit. In some cases it can be polished up to 1,500 or even 3,000. Dyes can be used in conjunction with polishing. Decorative saw cutting and dyeing over the top of the polishing can be done to enhance or provide decorative value to the actual polish. Cutting radial lines, grids, bands and borders can add dimension. The designs are unlimited. Stencils can be applied over the polished surface, sandblasting lettering, logos or any design. The designs are unlimited. Stencils can be applied over the polished surface, sandblasting lettering, logos or any design. In the early stages of pouring a concrete foundation, a range of aggregates can be selected that can be added into the concrete substrate, hand-applied or seeded into an actual foundation or concrete slab that can be ground and polished. It is considered sustainable and sought after by builders and architects because of the options and the use of existing materials that are already present. 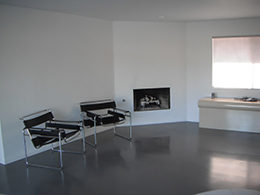 Polishing the exposed concrete eliminates energy and material that is typically consumed with the floor covering. It is an environmental choice that can offer a green solution. 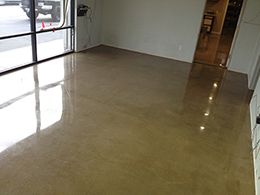 The polished concrete floors that we do in the city of Chino Hills are low in maintenance, durable and easy to clean. Many large clothing stores, Home Depot, Lowes, Walmart and super centers are polishing their existing substrate because of good abrasion resistance, mar resistance and scratch resistance. Polished concrete has a high coefficient with friction which makes it non-slippery. It also reduces dust mites and allergenic problems in addition to slowing and eliminating any mold growth which usually occurs under floor coverings. If you live in Chino Hills and would like us to give you a quick estimate over the phone, please call 1-888-287-0524. There is substantial evidence that it reduces the amount of lighting needed in large warehouses because of its ability to reflect light and improving the ability to accept natural lighting through windows, sunroofs or any other available sources. 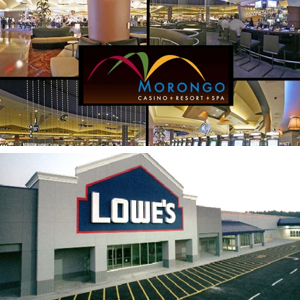 Our company provides systems architecturally based on DESIGN for every project we encounter. Concrete is what we specialize in period. We help with SPECIFiCATIONS of concrete. Without concrete none of us have a solid base foundation. Concrete is what our business is built upon. Being innovative is what sets us apart. We help with INSTALLATION for Contractors, Architects, Designers and Homeowners to explain all possibilities of the concrete industry.